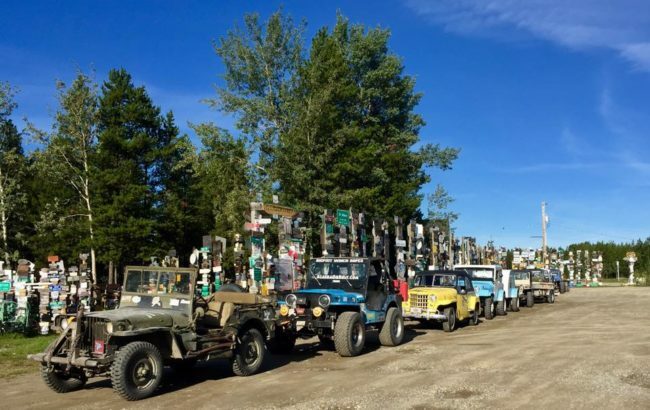 Alaska Or Rust jeeps parked in front of Watson Lake’s Sign Forest. The sign forest was a pleasant surprise. Yesterday the group split, with the Eilers and Vidals leaving Watson Lake early for a special event. 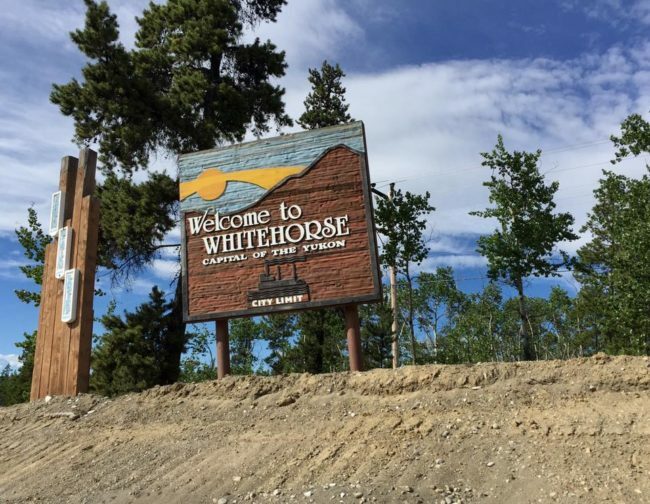 Eventually, we met up again in Whitehorse. The group split for most of Tuesday. Ann and I and Fernando and Hugo took off earlier than the others for a special birthday event for Hugo. 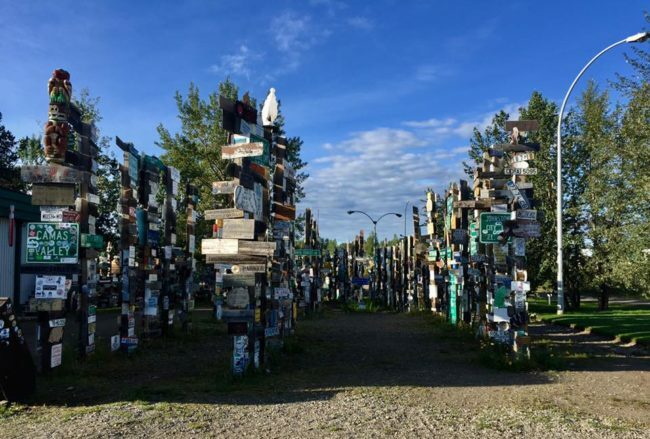 Before we left, we stopped at Watson Lake’s sign forest, which I thought was just a few hundred signs. In fact, one count places the number of signs at 75,000!! 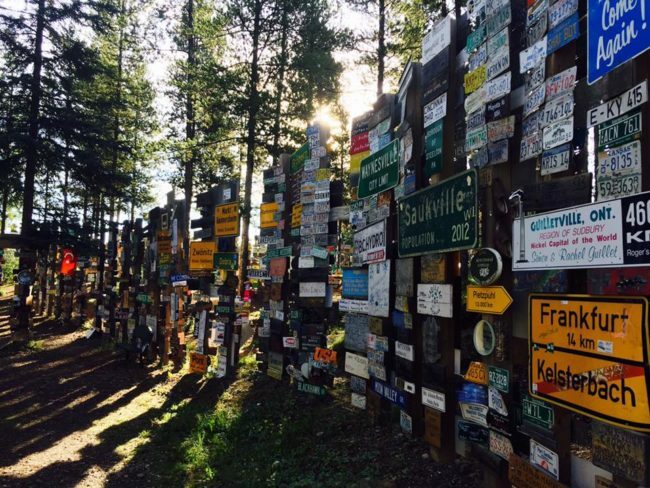 It truly is a forest of signs. It’s so big, that the convoy crew told me they spent almost an hour there. 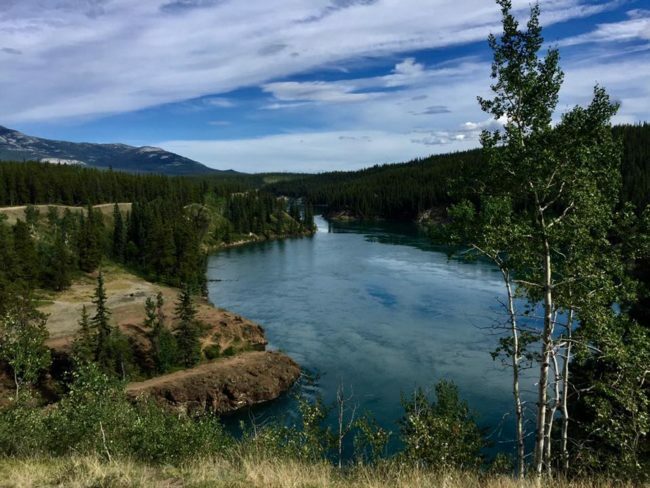 Here is a mix of photos from there. 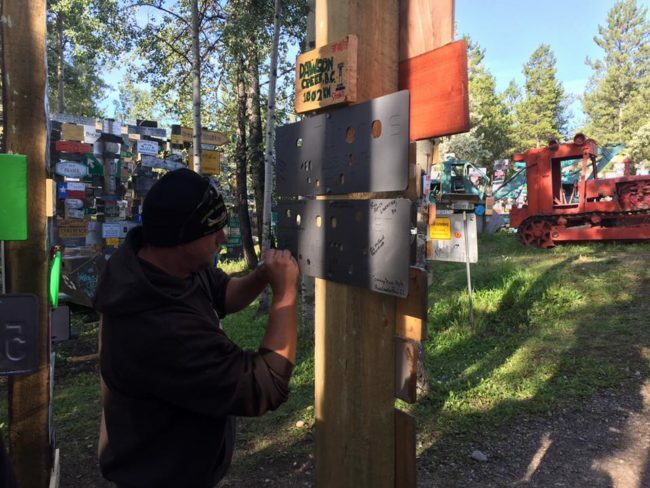 Marty crafted a couple signs, one for his family and one for Alaska Or Rust. 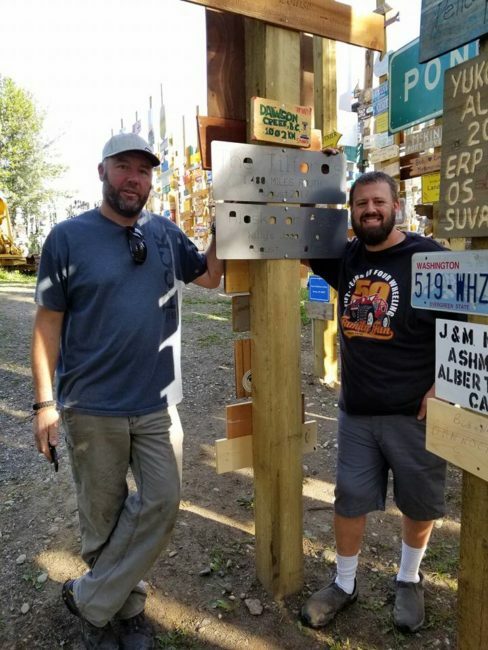 The Alaska Or Rust Convoy Crew, minus the Vidals and Eilers, at the sign forest. The reason the four of us left early, was due to a special event in Hugo’s honor. To explain it, we must step back in time. 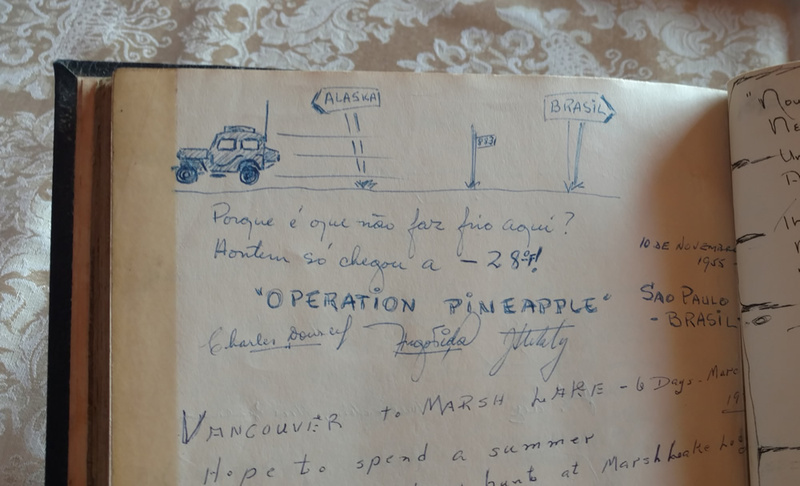 Hugo Vidal’s entry into the Marsh Lake Lodge’s visitor’s book. Several decades later, the wooden lodge burnt to the ground. It was a total loss. 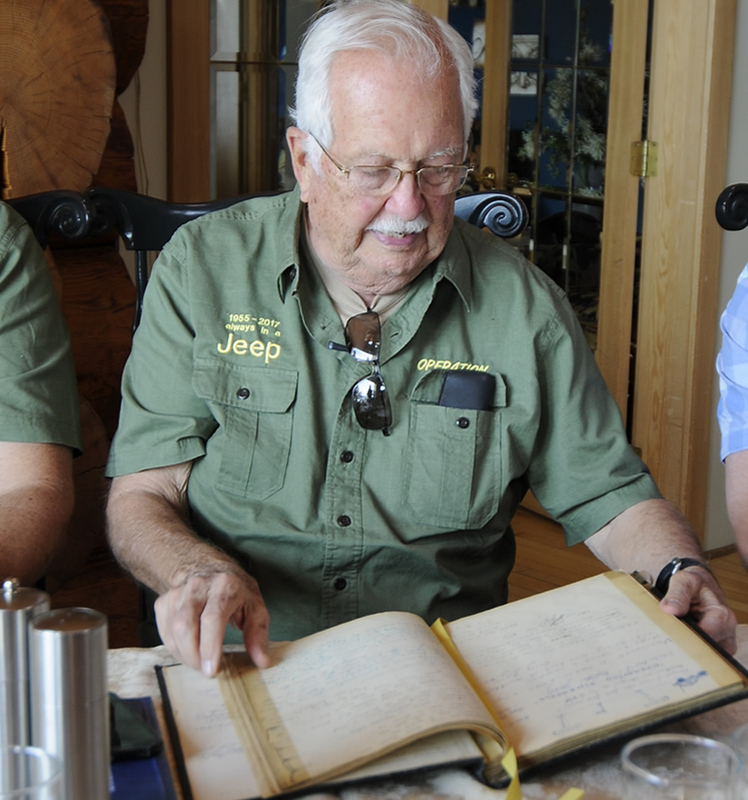 Unknown to everyone, the lodge visitor’s book survived, stored in a basement elsewhere. In the summer of 2016, Stephen Reynolds was offered a chance to look through the book. He randomly opened a few pages, then came upon the drawing of a jeep with the words Alaska and Brasil. They caught his attention, partly because Stephen had contacts in Brasil. One thing led to another and eventually Stephen was able to track down Hugo, then learned it was Hugo who had drawn the illustration! 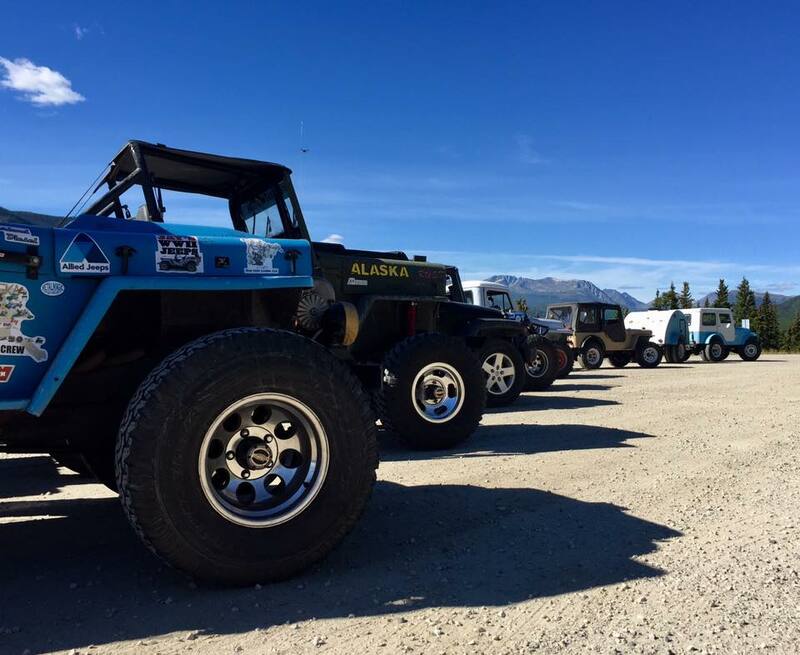 Our story might have ended there, but then some crazy jeep nuts from the US decided to launch Alaska Or Rust. They released a press release, which Kaiser Willys picked up and published on its site. Hugo spotted the release in early 2017 and immediately contacted his son Fernando, who was living in the United States by that time. Both requested more information about the trip. 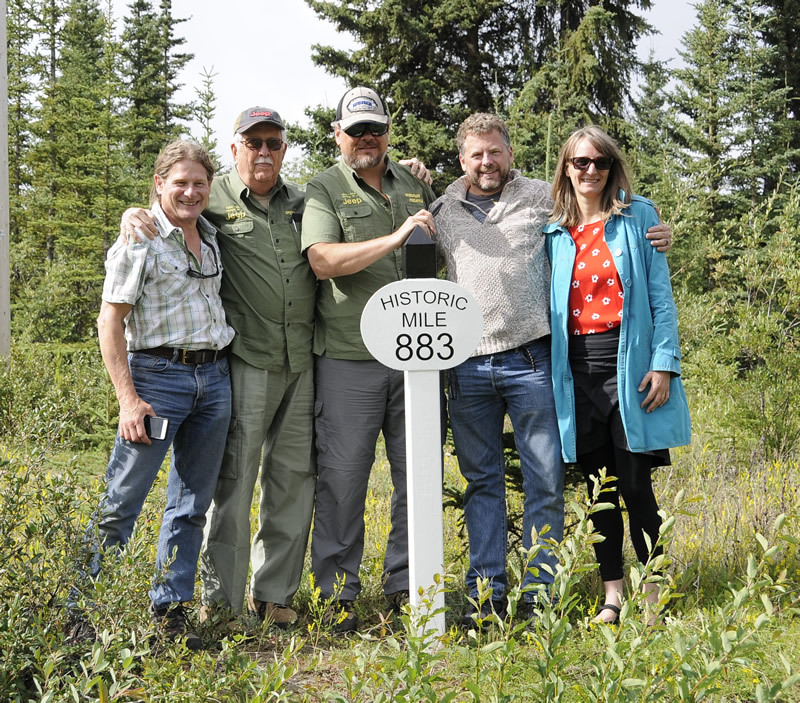 That’s when they discovered that the trip organizers had scheduled an itinerary that would take the group past the former Marsh Lake Lodge on August 1. That date just happened to be Hugo’s 84th birthday. Call it serendipity, coincidence, or fate, but with the stars aligning like that, Hugo and Fernando realized they had a chance to visit the spot where Hugo illustrated the drawing and it would happen on Hugo’s birthday. With that realization, the father-son team knew they had to join the Alaska Or Rust crew. So, they contacted me. What Hugo was not told was that Stephen Reynolds not only had a photo of the book, but that he had access to the book. That would be a secret between Fernando, Stephen, me, and a couple others. 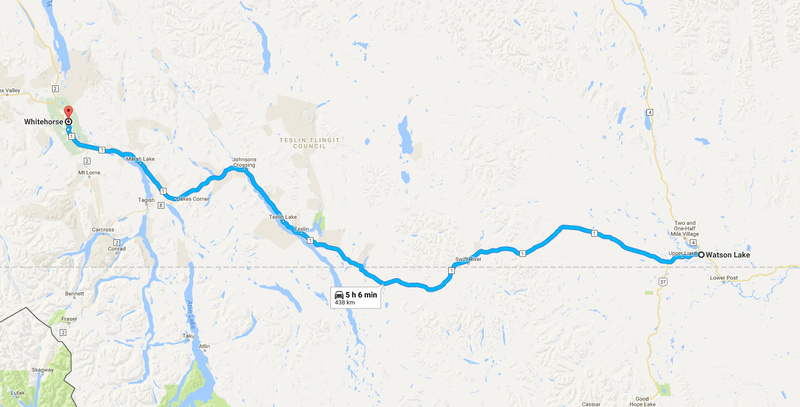 We arrived at mile post 883 (the Alaska Highway was originally marked in miles) at 11:30am. There to greet us and give us a short tour was Carson Schiffkorn, owner of Inn on the Lake , the lodge that eventually replaced the burnt-down Marsh Lake Lodge. Also there was, of course, Stephen Reynolds. 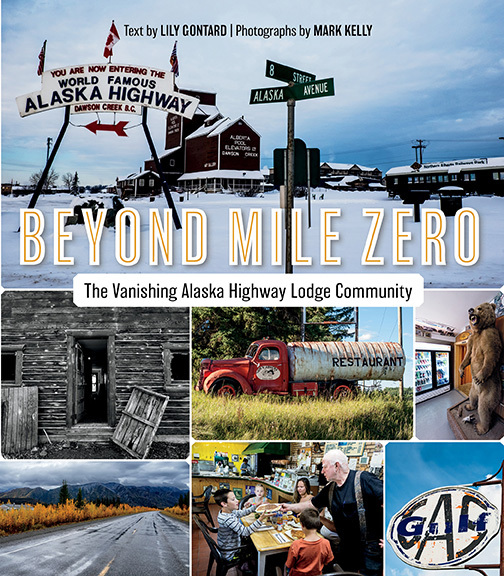 In addition, author Lily Gontard joined us; she recently released a book on the history of Alaska Highway lodges called Beyond Mile Zero: The Vanishing Alaska Highway Lodge Community. It’s a beautiful book and Lily was kind enough to give us a copy. Two folks joined us who documented the event. 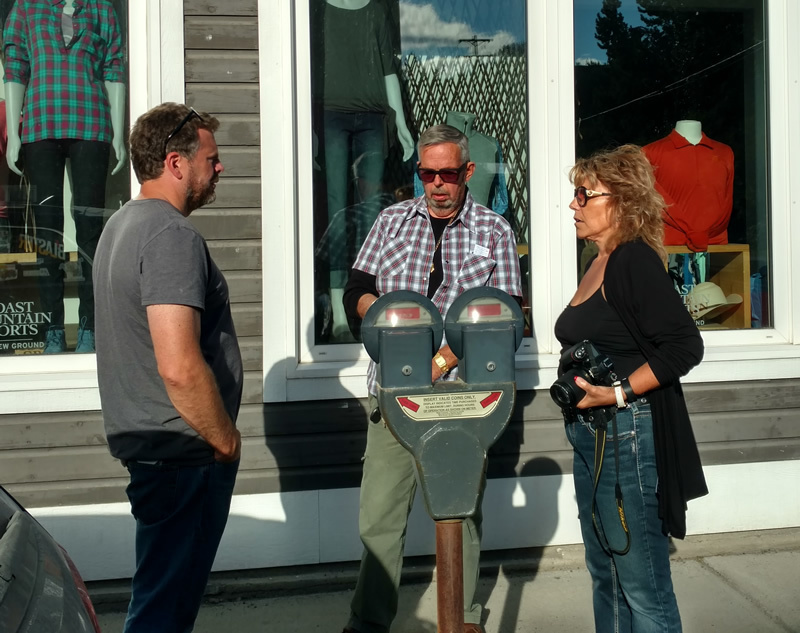 One was a cinematographer from the Fiat-Chrysler group that owns Jeep, there to document our trip from Watson Lake to Beaver Lodge. The second was a free lance author from Brazil. Finally, two more folks joined our small get together. 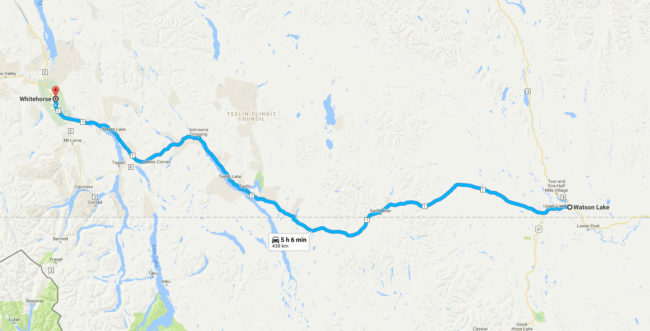 In fact, they’d been traveling with the Alaska Or Rust Group since Dawson Creek. One of the items I haven’t shared yet is the story of Hugo’s Brazillian friends Luis and Giselle (I probably have not spelled their names correctly, so my apologies). Two of Hugo’s closest friends, Hugo and his wife have travelled all over South America with them. 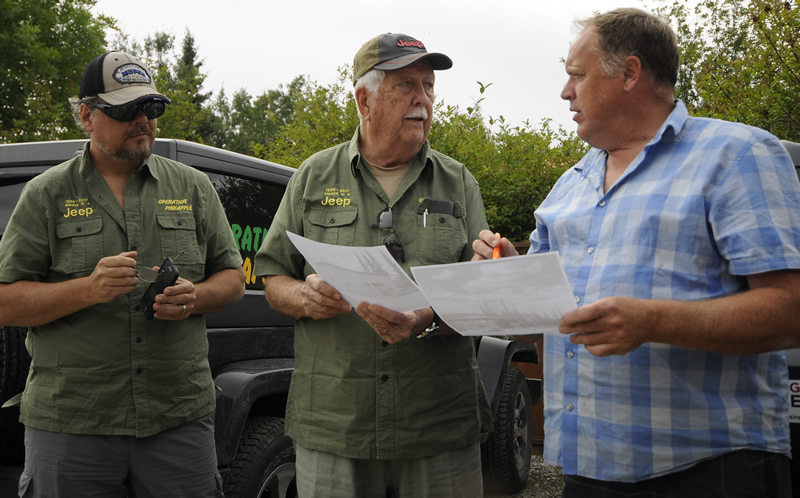 When Hugo told the couple that he’d being participating in Alaska Or Rust, they asked if they could tag along in their motorhome. Why of course, he told them! 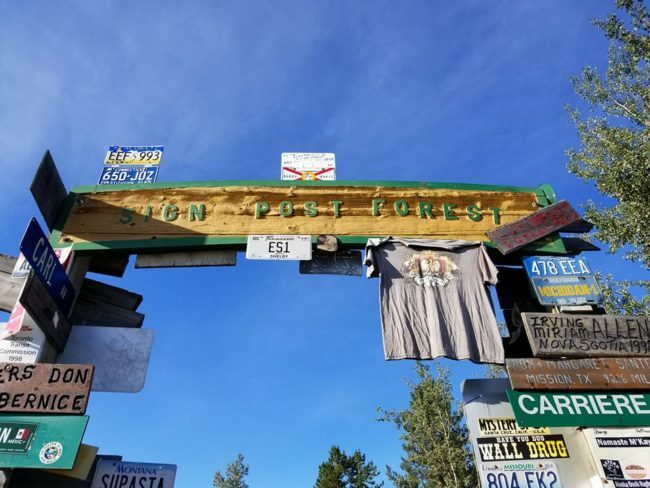 So they picked up their motorhome, which was stored in Phoenix, drove to Los Angeles to fix a snag in their Visas, then high tailed as best one can do in a Class A motorhome for Dawson Creek, arriving, in just four days of driving on the eve our departure! Luis can drive the motorhome like’s its a Porsche. He has little trouble keeping up, whether we make sudden turns or cruise down the highway. Not long after lunch had ended and as we were making our way to Whitehorse, Todd Penney shared the fact that Alaska Or Rust was front page news! 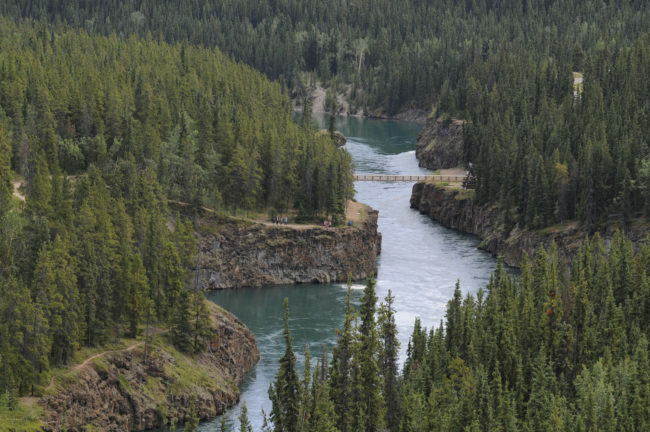 If you are driving the Alaska Highway, just before reaching Whitehorse, there’s a turnoff for Miles Canyon. Take it. There’s are a couple different places to park and see the beautiful Yukon River as it courses through Miles Canyon. We got some more Patterson signatures. 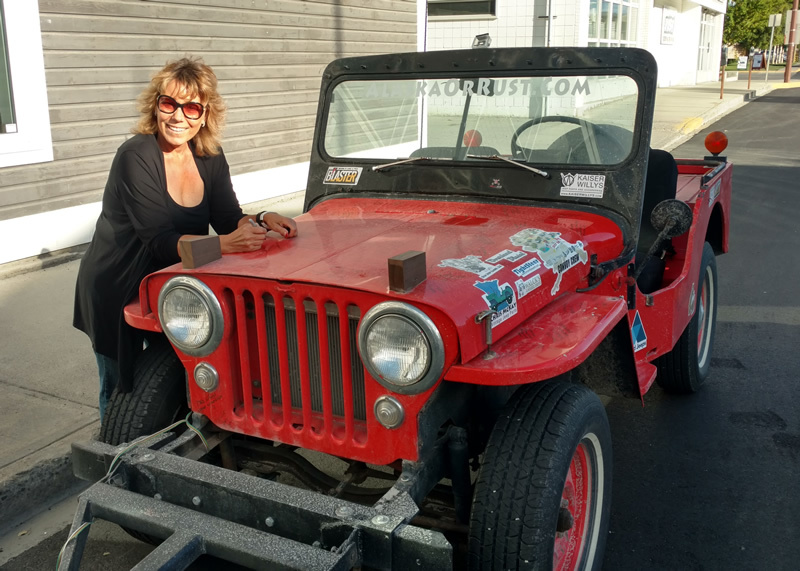 Picture below are Bev and Doug (aka Gold Nuggie Douggie), who drove into Whitehorse to see our jeeps. They best part of our journey has been meeting all the interesting people! The day wouldn’t be complete without a photo of Hugo opening his present from the Convoy Crew. 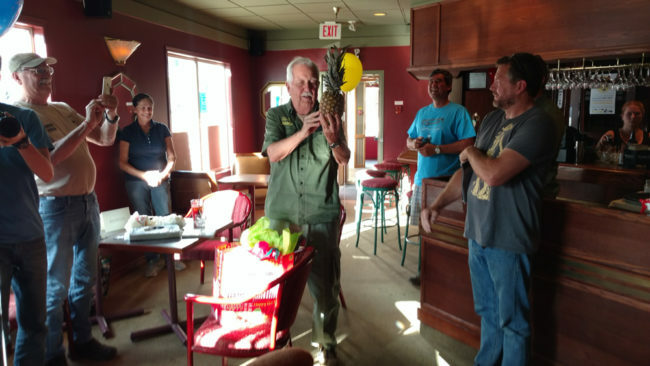 What do you get a man who travels around with Operation Pineapple on his jeep? 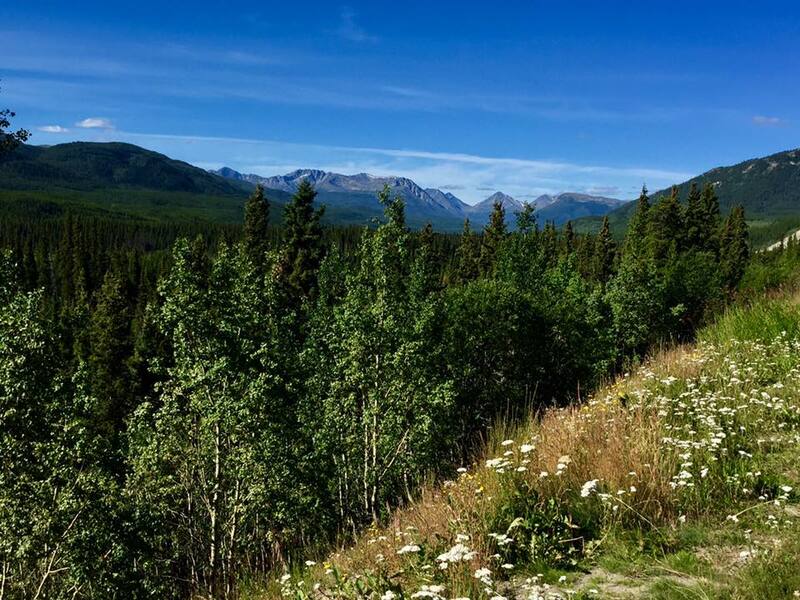 A pineapple of course .. not easy to find in the Yukon province! Many thanks to Stephen Reynolds and his employer The Department of Tourism & Culture who paid for the Convoy Team’s meal Tuesday night! This morning we head to Beaver Creek. 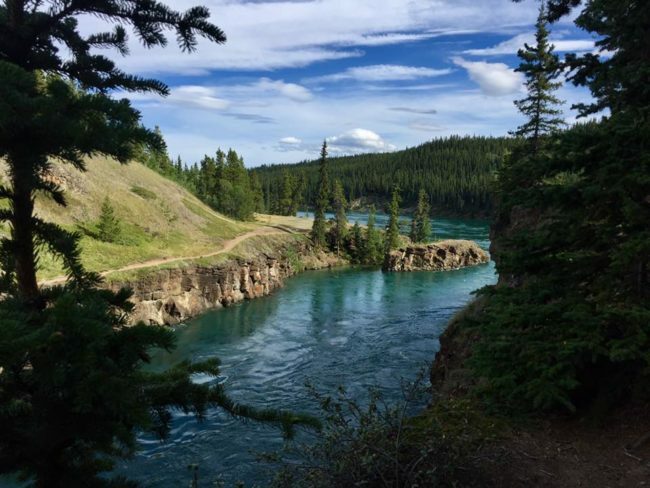 What a beautiful, a unique tribute, and special surprises of scenery in a very SPECIAL ADVENTURE. Thanks for sharing the details. Happy Birthday Hugo! Grilled pineapple is a Brazilian regular. 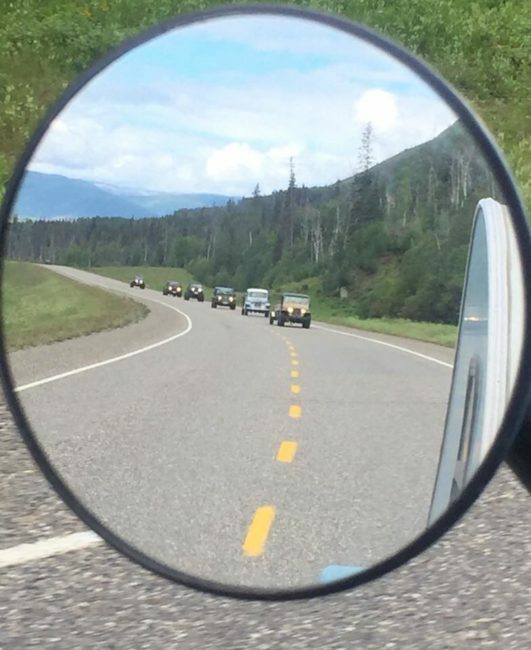 You guys seem to be having so much fun, where are you going next year? I love the whole story and all the wonderful twists, turns, and coincidences involved with Hugo. Memorable for all to be sure! May the joy continue with this adventure. We are currently on the side of the road just outside of Whitehorse. We have the onboard welder, drill, grinder, and other tools out to fix a cracked trailer frame. We have some smart, prepared folks with us! Yes indeed on the preparedness. Loved the video and I’m happy I found out what happened to my stolen truck from years ago, well at least the tag! 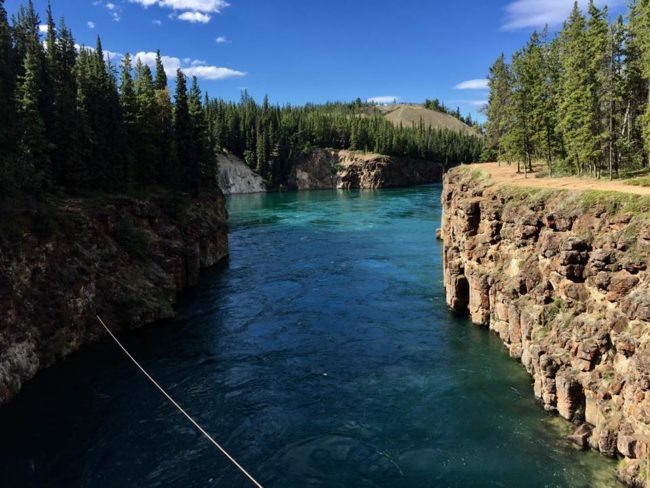 When they said it couldn’t be located anywhere in the lower 48, they meant it! Dad gum it. LOL, I hope you left a sign or T-shirt honoring the trek. I saw the T-shirt hanging up but my phone couldn’t zoom in to tell if it was a Alaska Or Rust T-shirt. Have fun guys enjoying the updates with a little attitude and a mix of fitness. 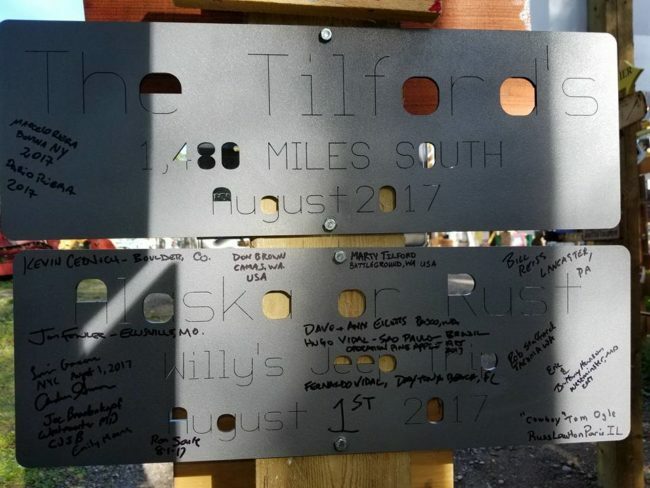 Well crap I didn’t get the full download of the site until after my post , sorry I see there was commemorative signs left. Well done and happy b-day Hugo and many more! 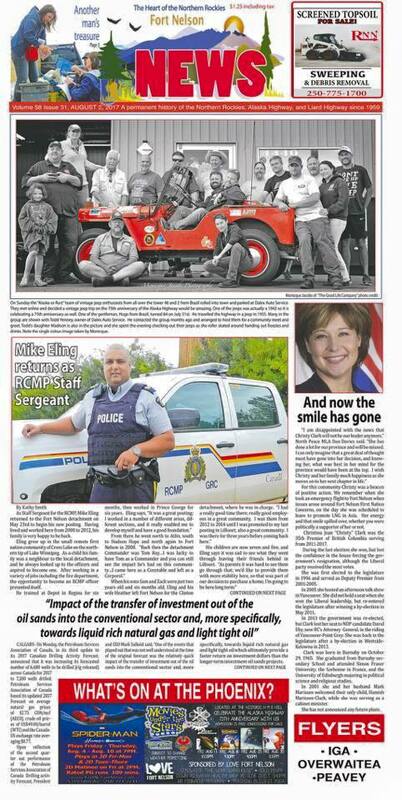 What a story this has turned into folks. Wow – what history! How cool. Happy birthday Hugo! 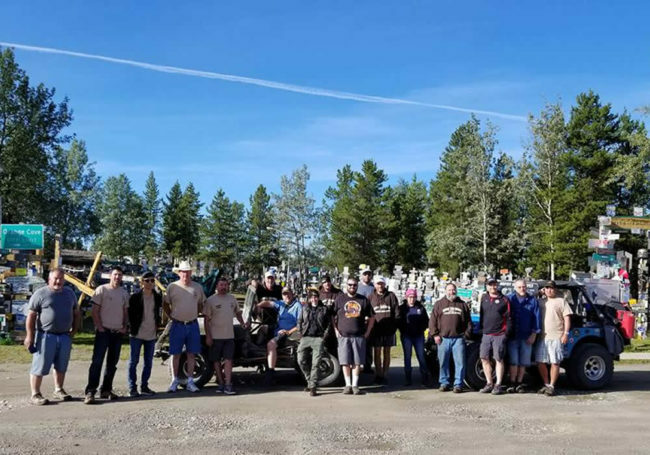 What a great story and all the coincidences that have occurred on this trip. What memories for all of you and especially 84 year old Hugo!! What an awesome story for Hugo!! The group was really cool to pull this off for him! Happy birthday Hugo! !